COPrevent: Don't forget about the Prescription Drug Abuse Among Youth event on 11/20! Don't forget about the Prescription Drug Abuse Among Youth event on 11/20! 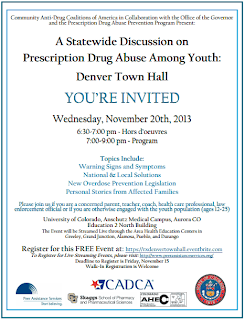 Please join us for the Denver Town Hall: A Statewide Discussion on Prescription Drug Abuse Among Youth. Our target audience is individuals that are engaged with youth aged 12 – 20 (e.g. parents, coaches, school personnel, health care professionals, law enforcement). The event will be streamed live to the Area Health Education Centers throughout the state (Greeley, Grand Junction, Durango, Alamosa, and Pueblo). This will encourage statewide participation and distribution of information. Register yourself for the in-person town hall meeting here, or register using the links on the bottom right of Peer Assistance Services site to participate in the live video streaming of the event around the state.